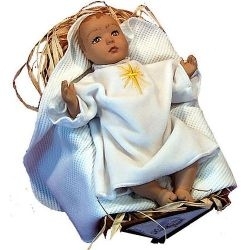 This Baby Jesus in the Manger is designed to be hugged and played with. Children will love its soft body, uniquely molded rubber head with hand-painted features, soft rubber extremities and costume of rich fabrics and accessories. Material: Head, hands, and feet are made from flexible urethane rubber for a skin-like feel. The body is made from inter-lock fabric and filled with poly-fil stuffing.